For this week’s blog post, I wanted to pay tribute to all the great plumbers out there (both fictional and real-life)! Including those that went on to achieve fame for various reasons, both good and bad! It isn’t always the most glamorous job, but it truly is something that our team loves to do each and every day. Having lived the life of a plumber for over 40 years, it doesn’t get much better than seeing a homeowner’s smile once their plumbing conundrum is fixed! Whether that be something minor, like a clogged drain, or a disaster, such as a flooded basement, finding a solution to the problem is a terrific feeling! 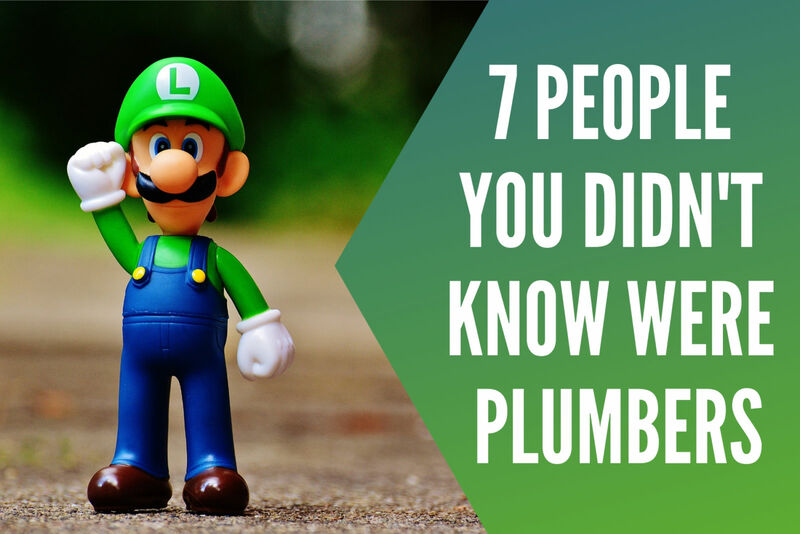 So, with further ado, let’s take a look at the 7 most famous plumbers of all-time. Hopefully, one day, we’ll be able to grace this same list (for the right reasons though!). I thought it’d be fitting to kick off the top 10 list with the godfather himself. Sir John Harrington is the one that started it all when he invented the first flushing toilet back in 1596. With a wash-down system, Harrington’s toilet would allow the bowl to be emptied after each use. While running water wasn’t easy to come by in the 1500’s, his design nonetheless set the foundation for future adaptations. As an ode to the English inventor, we often hear the term “The John” thrown around to describe a toilet. Yep, Academy Award-winning actor Michael Caine was once an aspiring plumber who was very interested in starting an apprenticeship. In the end though, plumbing just wasn’t for him and he went on to star in many high-budget films, including as Batman’s Butler! Certainly, the most famous fictional plumbers out there are Mario and Luigi. The Italian-American brothers have been around for years and have continued to bring great pride to the plumbing community. While in late-2017, there was some chatter that Mario’s official occupation was a plumber, we can assure you he is. He’s one of us! Our next man on the list got his claim to fame during the 2008 U.S. Presidential Election between Barack Obama and John McCain. After asking Obama about his small business tax policy during a campaign stop, Joe Wurzelbacher ended up being a household name as McCain referenced “Joe the Plumber” multiple times. Joe would go on to appear on Good Morning America and Fox News, before trading in his plumbing gear for a shot at public office. Last, but not least, we’ve got Ozzy Osbourne! The musician and reality-TV star is certainly one of the most noteworthy plumbers of all-time. At the young age of 15, he dropped out of school and chose to enter the ranks as a plumbing apprentice. It was long after though and he was busted for criminal activity. The rest is history, as he went into the music world and made his fame there. We hope you enjoyed reading about some of the most famous (or infamous) people to ever be involved in the plumbing world. If we missed someone that you feel is a better fit, feel free to let us know! Have a plumbing project in mind or just want to get some advice on what the best plan of attack should be? Don’t hesitate to give us a call to discuss! No matter what the situation is, we’re always happy to help!